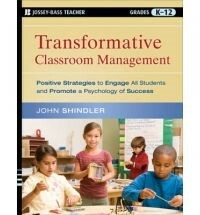 Dr. John Shindler, author of Transformative Classroom Management has been an educator for over 30 years and conducts workshops, and trainings internationally. He is a full Professor at CSULA and lives in Los Angeles. He brings a holistic perspective from years in the classroom, working with teachers one on one, working in schools on improvement, and as a top rated university instructor. He has presented to schools across the US including CA, NC, VA, TX, WA, TN, and Puerto Rico and has been invited to present to national audiences and the US DOE. Creating the 1-Style Classroom: How to promote community and student self-direction in any classroom. Creating a Psychology of Success/SEL: How to promote internal locus of control, a sense of acceptance and belonging, and a Growth vs Fixed Orientation in the minds and behavior of the students, the actions of the teachers, and the general way things are in the classroom. Understanding Motivation and Encouraging More Intrinsic Sources in Students: How to use extrinsic methods intelligently, and how to promote more internal and long term sources of motivation in students. Project-Based Learning: How to structure and assess project-based instruction so that it is increasingly more effective each time it is implemented. Creating a Living Classroom/and or School Social Contract: How to encourage all stakeholders at the school to invest and commit to the collective good at the school as agreed upon by everyone in this dynamic process. Creating a Bonded Classroom Community: How to use a variety of strategies to build a real and lasting sense of collective We to a classroom, including classroom meetings, use of mantras, and the practices that build community and those that limit it. We teach Who We Are, So Why Not Teach the Real You: This presentation helps teachers and leaders recognize when they are teaching from their highest self and when they are not, including many practical examples and skills that define the best you. Working with Challenging Students: How to change negative identities, encourage student self-responsibility, and how to negotiate potential power struggles. So that your most challenging students emerge over time into more positive and thoughtful contributors to the classroom collective. Promoting Positive Classroom Expectations: Learn how to use the strategies of the top 5% of teachers do to encourage all students to be on the same page and buy into a positive vision for themselves and the class as a whole. Using the PLSI learning Style Inventory to Promote Student Success:Learning about your learning style, how to use your knowledge of learning differences to encourage student success and meet all students needs. Creating Perfect Rubrics:Create rubrics that measure what you really want in a way that helps student understand where they are in their learning process. Assessing Process and Participation:Promote more internal locus of control, motivation and student effort by using a well-crafted system for assessing students learning progress.